Thank you for shopping in our online store. Modern Office is a small, family-owned and operated company providing a large selection of office furniture from over one hundred manufacturers at discounted prices combined with free shipping. Office furniture has been our area of expertise for over a quarter century. Whether you are looking for desks, chairs, conference tables, lecterns, reception furniture or many of our other furniture categories, you will be pleased with the experience at Modern Office. 1000's of office chairs stocked right here in our own warehouse. 30 Day Satisfaction Guarantee. Return any item for a full merchandise refund (see below details). We also carry over 100 brands of office furniture. Please ask us for a price on any item you've seen elsewhere. We probably have it and can save you money. Modern Office is a small, independent office furniture company. All items we sell or have made for us are selected by us for value, function, and style. Unlike many other office furniture retailers, we are not limited to selling items pre-chosen by a wholesale or franchise distribution program. We personally select furniture to offer in our own catalog and online store -- many of our competitors purchase an advertising or marketing program from a second party that includes items chosen by someone else -- they have little choice in what they offer the customer. The Modern Office catalog has been completely written and produced by us for over 30 years. Modern Office provides personal service by conscientious and knowledgeable employees - usually the same people who select our products and write for our catalog and online store - not uninformed order-takers or fulfillment company employees. Modern Office is an office furniture retailer that has an online store, not an �e-tailer� that happens to sell office furniture. Any company can open an online store and process orders within hours -- they can disappear just as quickly. Modern Office has been located in Eden Prairie, MN for over 30 years. We own and occupy our own office/warehouse building. 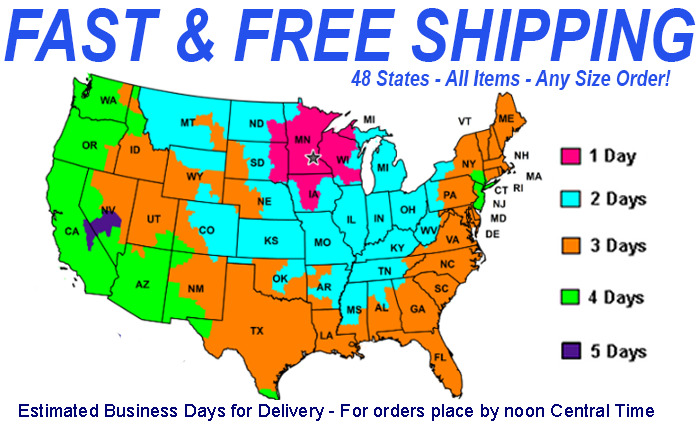 All items shown in our online catalog include free shipping in the 48 contiguous U.S. states. Address must be accessible to semi-trailer trucks for non-UPS size shipments. Hawaii, Alaska, Puerto Rico and international customers are welcome to contact us for a shipping quotation. APO/FPO orders subject to acceptance and USPS weight/size limits. Items identified as "truck shipments" include loading dock / tailgate delivery only and address must be accessible to a full-size semi trailer. Shipping companies are not required to transport shipping off their trucks and into buildings or homes. Inside delivery, residential delivery, island delivery, re-delivery, storage charges for shipments that a customer is not ready to accept, etc. are extra for truck shipments. Please contact us for a quotation. UPS, FedEx, and shipping companies do not deliver on weekends or evenings. Residential customers: You must be home to sign for truck shipments. If you are unable to be home the day of delivery, then pick-up at the carrier's local terminal may be necessary. Appointment deliveries or time window deliveries are usually not available. Some UPS/FedEx shipments are partially disassembled to reach carrier carton size limits. Cancellations after shipment are not possible. Please be sure to note any damage or shortage on the delivery receipt before signing for a shipment. Remember, title of goods passes to the purchaser when a shipment is accepted for transportation by the carrier. When you sign for a shipment, you are indicating that all cartons shown on the receipt are present and in good condition. If this is not true, be sure to note the discrepancy and have the driver initial it. Minnesota customers subject to 6.875% sales tax. Prices do not include applicable duties, taxes, customs brokerage, etc., for international customers. Please be assured that Modern Office does not share or sell customer information with any other companies or organizations. and every other city in the 48 states.